Abstract: The 79th China International Medical Equipment Fair will attract hundred thousands of visitors and over thousands of exhibitors will display their excellent or latest products on the spot. This time, Airwheel will take this opportunity to let more visitor know its smart electric wheelchairs. The China International Medical Equipment Fair (CMEF) widely covers 15,000 products such as medical imaging, IVD, electronics, optics, first aid, rehabilitation nursing, medical IT and outsourcing services, and it serves the entire value chain of medical devices from the source to the end in a direct and all-round way. 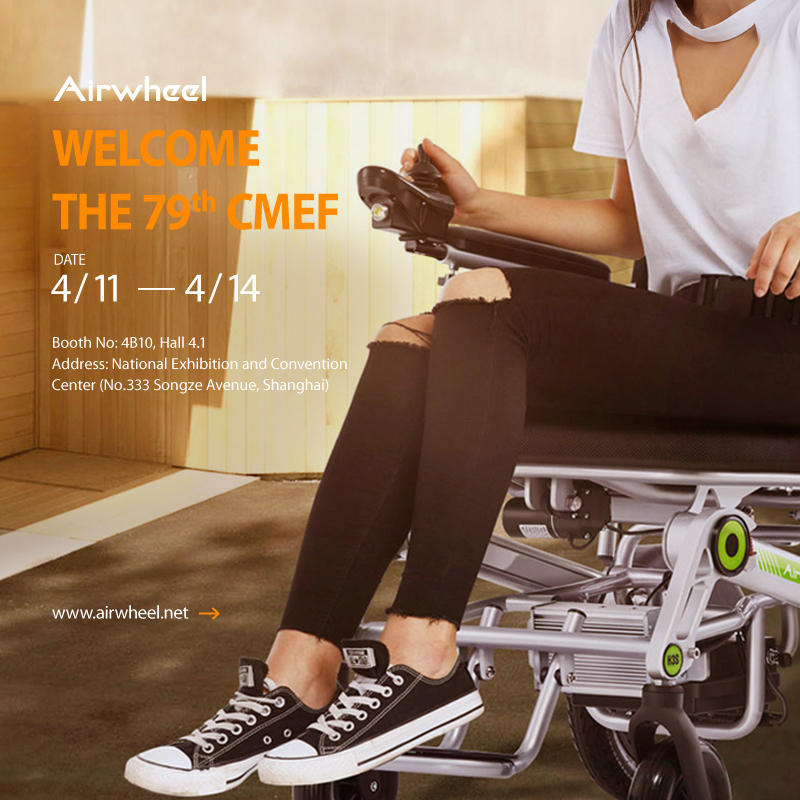 It is the first time for Airwheel mars rover to attend the CMEF, mainly because it has launched several smart power chairs for the weak and for those who lack sufficient mobility, strength , or dexterity in legs. The 79th CMEF will start on Apr. 11 and last to 14, 2018 and it locates National Exhibition and Convention Center (No.333 Songze Avenue, Shanghai). Available in various sizes, styles, and models, Airwheel's intelligent personal transportation devices are engineered to match the needs of the modern consumer. This time, Airwheel will bring its latest achievements for visitors to test it, like the electric wheelchairs. Welcome to say hello to us at booth 4B10, Hall 4.1. Airwheel smart wheelchair is symbolic of Airwheel new technology. Airwheel H8 is famous for its convenience with the large storage box. H3S is featuring automatic folding system, App remote control and retractable mini table and more. A6S and A6T are self-balancing chairs with joystick controller and handlebar respectively. A6S requires two ways to control, one is pushing the joystick controller to turn left or right, the other is leaning forward or backward to go forward or backward. A6T has no joystick controller, but it installs a handlebar. Hence, it has similar riding ways like S3, changing the gravity center. It is important to mention that, H3S electric wheelchair has installed a visual tracking camera that allow it to follow users, with the maximum speed 3.5km. The joystick controller not only makes the ride much easier, but also allows riders to change the following mode and riding mode. Learn more from at booth 4B10, Hall 4.1 at CEMF from Apr. 11 to 14, 2018. Next：Airwheel Smart auto-following suitcase SR5 is going to the 2018 HK Electronics Fair, Would You Give It a Go?